Cavy Angel's Guinea Pig Rescue responded to an online classified ad. The man stated he no longer had time to breed the guinea pigs and wonted them gone and would provided the cage that they where living in. On arrival the man opened the boot of his Sudan where the guinea pigs where hot and panting for air they where also housed in a filthy 42cm wide x 64cm long x 21cm high cage if you can even call that a cage. 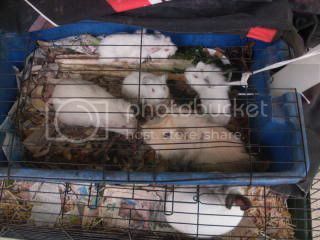 Altogether there where 5 guinea pigs surrender 3 babies, adult male and an adult pregnant female.